of an extreme risk of black ice. December was extremely mild. In fact, December 2015 was the warmest ever recorded, with no frost at all. The warm weather continued into New Year's Day, when we went for a very pleasant ride through the countryside, but by the 3rd of January everything had changed. Part way through my ride, I found I was accumulating ice - particularly on my mirror. Winter has now well and truly arrived. It's "only" -5 C ("feels like" about -15 C, apparently) and we've had much lower temperatures in previous winters, but we've never had such widespread black ice as we have at the moment. There have been many crashes on the roads and that's why there a "code red" emergency has been declared and everyone has been told to stay home rather than risk travel. Even a skating marathon has had to be cancelled because of cold weather. 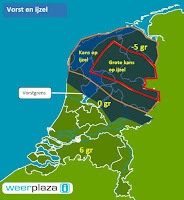 Of course, when told to stay home because of the weather, some Dutch people see conditions suitable for play, so the local news has been full of videos of local people doing things such as skating along roads. I first headed out into the countryside on a small recreational path. It looks quite clear, but actually the surface is like a very rough skating rink. I had to limit my speed to 10 km/h in order to ride in anything approaching a straight line. Not suitable for two wheels. The same path. Three wheels make it much safer ! On this photo you can see what the surface was like. Cyclists who went along here a few days ago left ridges behind, which have now frozen solid. These grab your wheels and make riding in a straight line dangerous. Everything in-between is super slippery ice. Heading back into civilization on the same skating track. "Civilization" turned out to be just as dangerous. These residential streets offered no grip whatsoever. In a local shopping centre most cycle-racks are empty and many of those who are here with bicycles are walking rather than riding. I don't normally go shopping by velomobile, but I did today. It's not nearly full, but this is plenty for us to eat over the next few days. Main cycle-route on the way home. Snow-ploughs are not quite so wide as cycle-paths so we usually end up with a bit of ice at the sides.. The main routes were mostly OK. While here the whole width looked OK, but in some places it was rather slippery. Hence this woman choosing to walk. Bridges are often particularly slippery because they freeze from underneath. But this one was fine. Few people had reached the city centre. It was nothing like the busy-ness of the time just before Christmas. Another person who found walking more to her taste than riding. Car parks too were nearly empty too. People are put off driving as well as cycling by conditions like this. This one was particularly slippery and dangerous. More treacherous pavements for pedestrians, so these people are on the cycle-path, which at this point is actually OK. Completely empty school cycle-parking because the schools are closed. In the past they've remained open and the cycle-parks have been full with much lower temperatures, but that's not realistic with these slippery conditions. Some paths seemed to be fantastically clear for no obvious reason. This has obviously been swept, but it's not a main route. Another residential street. Not many cars moved today. Many people have stayed home. Assen has many cycle-tunnels. Conditions were fine for cycling through this one, and probably so for the others as well as they tend to be on main routes. After perhaps the slowest 11 km long ride I've ever made, I'm back home. These days it's warm inside without a huge heating bill because we've invested in insulation and saving energy, Our monthly combined gas and electricity bill has dropped to around €50, a huge improvement over the extraordinary amount which it cost to live here when we first moved in. We use a post-office which is quite close to our home. This video shows the entire distance there and back again by two nearly identical routes. Later in the day I read the sad news that someone died today in Assen due to the ice. A pedestrian slipped on a street in Kloosterveen, where I cycled this morning for shopping. He fell hard on his head and was fatally wounded. My condolences to his family. Clearing ice from paths, cycle-paths and roads is very important. Yes, here in Montréal, no real snow until just before New Year's. But right now I'm not cycling - younger people are - because of icy conditions. Not as bad as yours overall, but treacherous patches. I confess I'm actually using my late mum's cane (with fold-out spikes for ice) or I could scarcely walk. Lots of people falling and hurting themselves. By our standards it really isn't cold - weather such as you show. If it were dry, I'd definitely cycle at -5°C. Wonderful photos. I tend to avoid cycling on snow and ice covered roads, too, though I did once cycle through a snow storm in Belfast when I was a student there. The snow was thick on the road and compacted by car tyres, and I even carried an umbrella to fend off the densely falling snowflakes! I'll be visiting Copenhagen this weekend and am looking forward to getting on a bike sometime, though it's going to be very cold - below zero day and night. I rode in Minneapolis (Minnesota, USA) in March of 2014. The temperature was (-5° F) (-20° C). The paths were plowed, but not at the same level of service & diligence as it appears in your video. I rode on standard commuter bike tires -- 1.5 inches (3.8 cm) in width. The ice on the paths was rough and partly sanded, but still, I was grateful for the studs on the tires. I did notice that many Minneapolisians were also using fat-tire bikes over the rough ice. Their 4+ inch (10+ cm) - wide tires allowed them to have a much smoother ride than otherwise anticipated. No matter how wide, knobby,or well-studded a tire may be, though, I know of no rubber-tired vehicle able to handle glass-smooth ice. Even if I'm driving a very heavy truck, if the ice is glass-smooth, it ain't worth rolling on it. PS: Chaining up truck tires (to travel the last icy mile or 1.6 kilometres) at 10,000 feet (3048 metres) up in Breckinridge (Colorado) makes for a very interesting high-altitude experience. Don't worry. The ice was NOT glass-smooth. As a Canadian, this made me chuckle a bit: that -5°C can bring the city to a halt. But I lived in Europe for many years, so I know how bad the winter weather can get if there is no infrastructure to deal with it (e.g., rapid plowing and salting). Jason: Be careful with assumptions about "Europe". It's a bit like generalizing about "North America". 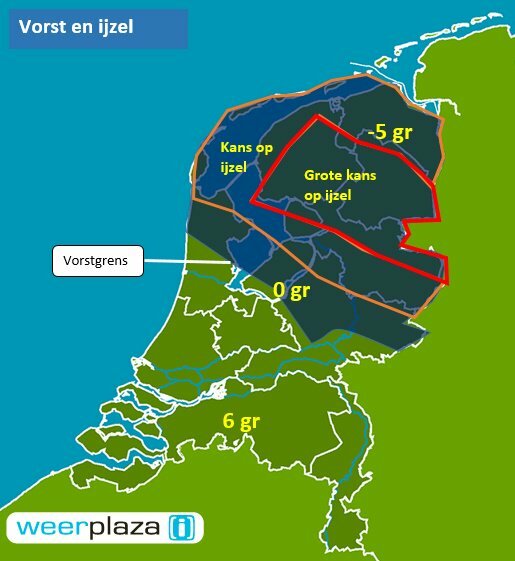 While -5 C is never reached in the more Southern parts of Europe and would be very cold by the standards of most of the UK, it isn't cold at all by the standard of where I live in the Netherlands. As I pointed out above, it sometimes gets down closer to -20 C and normally this makes very little difference to how people get about. However, the weather last week was a problem for a reason other than the temperature alone: The ground temperature was about -5 C, but a warm layer in the atmosphere resulted in liquid rain falling over a large area and freezing to a nasty glass-smooth surface which was in some cases up to 5 cm deep. You can't move that so easily ! Luckily, it warmed up considerably and thawed a couple of days later. We're now expecting another freeze, but hopefully without that ice. I've also got videos on youtube of commuting in snow and ice. A couple of years ago I was doing a 60 km round trip by bike to get to work and I did it all the way through winter, sometimes setting off from home in the dark at temperatures around -15 C. You can see the videos here. I understand that on bicycles (two wheelers) one should use spiked tyres on the front wheel for sure in ice and snow, and maybe the rear wheel, but that on recumbents and other tadpole trikes, one should definitely use a spiked tyre on the rear wheel to stop it spinning and flipping over, could you also use spiked tyres on the front wheels of your velomobile? They are the ones with the brakes and they steer it. I hope conditions are better in Assen now. Matt: With a two-wheeler (upright or recumbent), any directional control and of course the balance comes from the front wheel so if this slips you're usually off your bike very quickly. But with a tadpole trike it's different. The rear wheel acts as a rudder keeping you going in a straight line. It's not just with ice that you have to be careful. Brakes on the rear wheel of a tadpole trike are a very bad idea because if you lose grip on the back then there's nothing to stop the trike from rotating on the road so that you end up sideways and can flip over. Punctures in the rear at speed can be "exciting" with a tadpole trike (I almost always use a Marathon Plus at the rear for this reason). I could use spiked tyres on the front of the velomobile as well and that would improve handling, but I wouldn't want them on the front with a normal tyre on the back because that would tip the balance towards the front having more grip than the back and it'd probably mean a complete loss of directional control and a crash on the very first corner in ice. The rear has the opposite effect: You keep going on a straight line when you brake on ice, but you still have directional control to a degree. It's warmer in Assen at the moment. We had snow overnight, but it's thawing out this morning. Thanks for the explanation David. So far, we are in single figures and sub-zero overnight in inner London but I have main roads near me that don't usually freeze over because of the volume of motor traffic, and I will just go more slowly, especially on bends on minor roads. Once my tyres wear out, however, I may just have to get some Schwalbe Marathons or Duranos (so far I am very keen on Schwalbe tyres).